I really enjoy following the evolution of pedalboards of the pros. 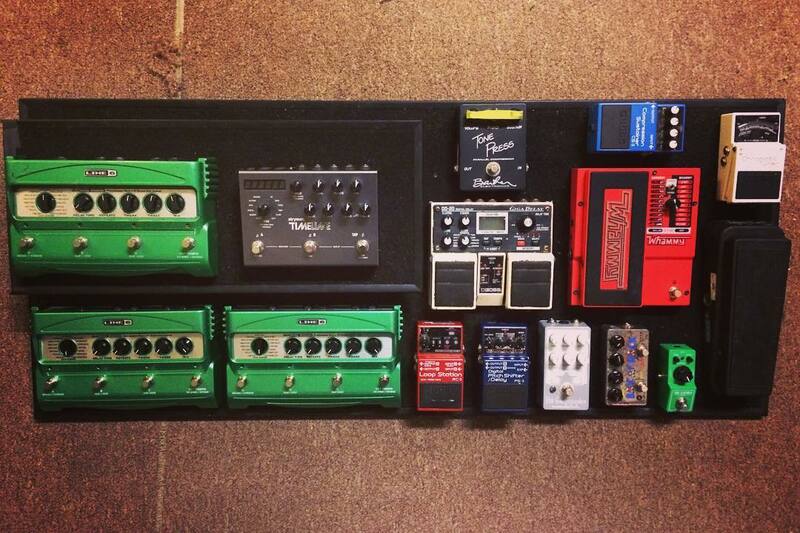 I recently saw an Instagram post for David Knudson (of Minus the Bear) where he was laying out his new board for their tour. David Knudson is really known for his crazy style of “real time” loops and his use of Line 6 DL4 delays. Seriously, you need to check out some up close videos of his footwork. It’s quite amazing. I like watching how pedalboards change throughout the years. Here is a post I did for David back in 2013, and you can see what fell off, and what replaced it. Back in those days, he ran with 4x DL4s. Nuts. Let me know what you think of this set up or Minus the Bear by commenting below! I don’t have that many ,just the basics. Cry baby wah ,Ibanez tube screamer ts9, Ibanez compressor cp9, mxr phase 90, and boss delay dd-6. Thinking of a fuzz but I want to keep it a limited string of pedals. I wouldn’t be able to keep track of many more.